The founder of a charity that trains dogs to assist people with disabilities was honoured by the canine and humans she had brought together. The funeral for Jenny Clarke was organised by AE Joliffe & Son, part of Dorset’s Douch Family Funeral Directors, and staff said they’d never done anything quite like it. More than 30 dogs trained at the charity – Woofability – and their owners lined the route of her funeral cortege in Poole, and they joined over 200 mourners in the crematorium. Nearly 50 golden retrievers and labradors have been through the three-year training programme. 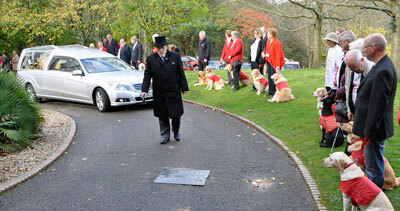 Her husband Andy said: “The funeral was a great tribute to Jenny and she would have loved seeing all the dogs there.